Freshen up your beloved pet’s bad breath with the innovative Oxyfresh Pet Oral Hygiene Solution! This dental product contains 16 oz. of highly effective water additive that promotes healthy teeth and gums. Here at Oxyfresh, we take pride in only using high-quality ingredients that are made in the U.S.A. Our product is alcohol-free and non-toxic, making it perfectly safe for any pet to digest. Simply add a capful of Oxyfresh Pet Oral Hygiene Solution in your pet’s water bowl every day. It is odorless and tasteless, so your dog or cat won’t notice! You don’t need to brush your pets’ teeth or give them solid products that need to be chewed. Oxygene saves you time and effort while delivering excellent results! 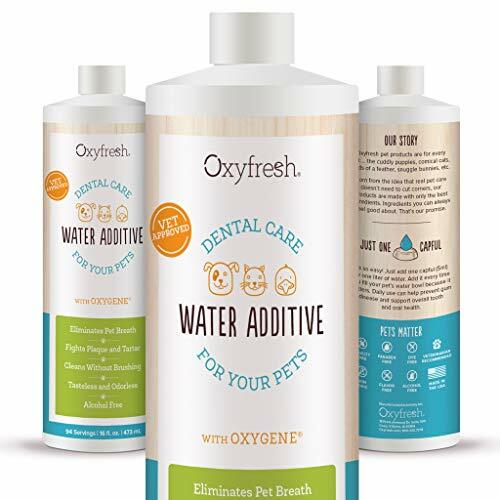 Highly recommended by North American veterinarians, the Oxyfresh Pet Oral Hygiene Solution is your go-to pet oral care solution that will clean and deodorize your pet’s mouth for bad breath. It can be used on dogs, cats, birds, horses, and rabbits. FRESH BREATH - Finally say good-bye to pet bad breath with fast-acting patented Oxygene® formula. Works for dogs, cats, birds, etc.